Eastern hemisphere on one side, western on the other. 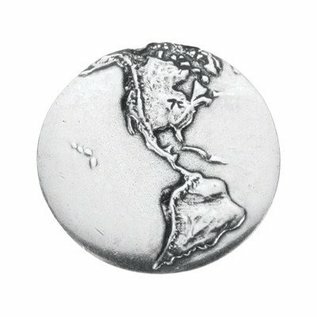 Our Earth pewter palm stone is a unique gift that has been carried in pockets to many far off places. Made in Vermont. Eastern hemisphere on one side, western on the other. Our Earth pewter palm stone is a unique gift that has been carried in pockets to many far off places. 1 1/2 high 1 1/2 wide. "From our workshop in Middlebury, Vermont, we make American pewter inspired by ancient craft and modern day design. We create beautiful objects — rooted in simplicity and functionality — designed to be used: Christmas ornaments passed down through generations, oil lamps to light cozy homes, jewelry to adorn the everyday. We honor the metal, we celebrate milestones, and we elevate the everyday with handcrafted pewter designed to stand the test of time."